When an effects pedal maker’s logo is a wild haired, wide flared madman wailing away on a guitar with his foot firmly glued to his wah wah pedal, you know you’re on to a winner. Yet it’s more than just a canny logo that makes Morley one of the most respected and loved names out there. Morley is a name that conjures up a distinct sound amongst its fans, a kitemark of high build quality, thoroughbred US construction, clever features and housing that could stop a tank. Founded by Raymond and Marvin Lubow in Los Angeles back in the 60’s, Morley pedals quickly became popular thanks to the wealth of features that accompanied their devastating sound. Built and tested by hand, today Morley pedals are simply the best pedals of their type out there. 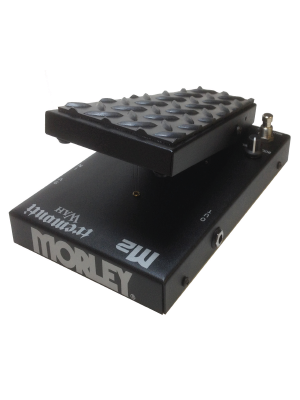 Morley wah wahs and volume units have been used by some of the biggest names around, and continue to astound newcomers who find out for the first time just what Morley pedals are capable of. Having been championed by everyone from Steve Vai to Al Dimeola, J Mascis and more, Morley pedals have more than just All American pedigree – they have the sound that no pedal board is complete without.